& recording of your event. We can cover your conference or live event with multiple cameras with real time video switching and editing all while recorded or broadcast streamed live over the web. We can mix multiple camera angles, full screen or picture in picture slides, and floating graphics to make your presentation as dynamic as possible. 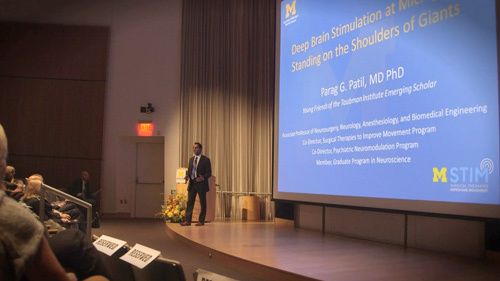 As a registered and insured vendor of the University of Michigan we have recorded numerous CME Conferences and Lectures over the years. Several day conferences, short speeches, solo performances to concerts - whatever the case, we've got it covered. With a no-nonsense approach we will get the best image and sound we can - even on short notice. We have covered musical events from the Life Sciences Orchestra to the Concert of Colors using an array of broadcast quality cameras. With our high tech video switch box we can mix the feeds from several video cameras, the presenters deck, and add specialized and floating graphics. CME to MACY to GLAAC we are a standard go-to vendor for units in University of Michigan for over 10 years. We covered two days of presentations and breakout sessions. Each session was edited together with slides, presenter title and logos. We created one highlight video you can see here. Two camera coverage for a half-day event. We recorded speakers, interviews, and b-roll to create a highlight video of the days events. I wanted to thank you for the excellent work on the video.